Thanks to the foundation's support, 11 young adults with autism completed their formal training Monday and began their professional careers as animators and visual effects artists. SHERMAN OAKS, Calif., June 13, 2018	(Newswire.com) - They spoke of vision and heart at Monday’s commencement for 11 young adults with autism who have completed their formal training at Exceptional Minds vocational school. Addressing the family and friends gathered for the event, actress Jane Seymour spoke of how the unique school and working studio captured her heart when she first toured it months ago. “Exceptional Minds started as an idea in a one-room schoolhouse, and what you see today, the fifth graduating class of Exceptional Minds, is extraordinary,” said the Emmy® and Golden Globe® award-winning actress known for her roles in the James Bond film Live and Let Die and the television series Dr. Quinn, Medicine Woman. “It takes heart to make this happen,” she said. 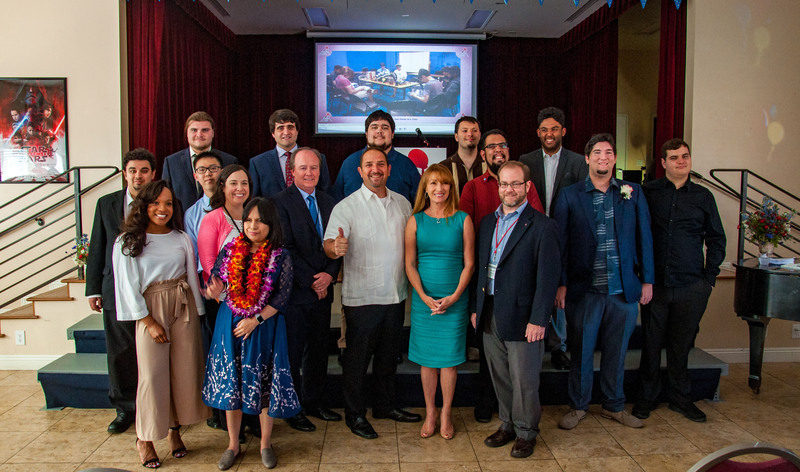 During the graduation, the students and staff awarded Mitsubishi Electric America Foundation (MEAF) with its Exceptional Minds Hero Award. Mitsubishi Electrics’ Executive Vice President and COO Michael Corbo accepted the award on behalf of the foundation, which has provided much-needed funding for the school’s work readiness program. “Our foundation’s vision is to support organizations that empower youth with disabilities to ‘achieve their possible.’ Exceptional Minds does that and more,” said Corbo. “Thank you Mr. Corbo and Mitsubishi Electric America for your commitment and support of Exceptional Minds. We wouldn’t be where we are today without the support of our amazing Exceptional Minds community,” said 2018 graduate Nathan Folsom. “I am a completely different person than when I first arrived. Not only did my art and animation skills improve exponentially, but I’m now a lot more social ... I’ve made good friends here,” commented graduate Jacob Lenard who will begin his career in animation as an intern at Warner Bros. following Monday’s graduation. Several students also begin summer internships at Warner Bros., Cartoon Network, Nickelodeon, Kappa Studios and Psychic Bunny. Others from the Class of 2018 will begin their careers in the Exceptional Minds Studio, which completed visual effects work on productions such as Star Wars: The Last Jedi, Avengers: Infinity War and The Good Doctor. Exceptional Minds opened its doors in 2011 with a first-year class of nine students. An estimated 90 percent of young people with autism are under or unemployed. More than a half-million individuals with autism will enter adulthood in the next decade, the vast majority of whom are ill-prepared for meaningful employment. Everyone and every business has a story to tell. We give them a voice. The studio of professionals on the spectrum is transforming employment expectations for a population that has one of the highest unemployment rates. One problem remains for producing live programming between sites or consolidating stations into one regional operating center. SwitchBlade is the missing link that makes it possible to turn on a mic or set a fader from faraway, and it's being introduced at the NAB Show next month by Wheatstone Corp. The studio of working professionals on the spectrum started 2019 with 128 movies and television shows to its credit, including three of the five 2019 Oscar nominees in the visual effects category ('Avengers: Infinity War,' 'First Man,' and 'Solo: A Star Wars Story').